Julia Napolitano you are a wonderful daughter. Julia Napolitano wanted to make both her life and her mother's life meaningful. 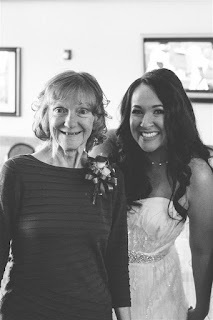 So she held her wedding reception at her mother's memory care community. Reading this article on Today.com made me feel happy and hopeful. So I decided to share the link with you so you can read it also. All it takes is an open mind, big heart, and a little bit of courage. "She may not be the same person in every sense, but she is alive," she said. "And we need to share that life, even if it's only for a short amount of time." "What was really magical was the moment when she danced with my dad. They have been married for more than 30 years. They swayed to the music, and as you can imagine, it was extremely emotional. He always assumed she would be there to give me away." "She's been in such good spirits since then. It's actually been amazing. Clearly, we need to get married more often."